CleanCalc is an energy analysis tool that stems from the vision of ISMI and the ISMI company members. The development team is constituted of ISMI advisory personnel, company member personnel, Ralph Cohen Consultancy and Hands Down Software. CleanCalc I was developed and released in 2008. CleanCalc I was a Microsoft Excel based program that was written in VBA and was limited to only one cleanroom and four simulations. CleancCalc I had only one report type and one graph page with four fixed graphs per simulation. CleanCalc I was a great success. CleanCalc II was developed and released in 2009. 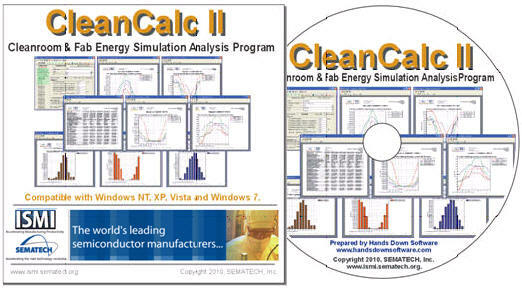 CleanCalc II is a stand alone program that was written in Microsoft Visual Basic. CleanCalc II allows for many different room types including cleanroom, fab, clean and dirty sub-fab cleanrooms, utility rooms, clean support, non-clean support, bottle gas room, chemical dispense room, computer rooms, test-sort-probe rooms, chiller plant, UPW plant, boiler rooms, other utility areas along with the ability to create your own room types. Multiple site level and room level reports are selectable and up to 97 different graphs are selectable for output. With one button click, output can be printed, exported as PDF or .CSV for emailing or importing into Excel, or can be copied to the Windows clipboard for pasting into your reports and presentations.